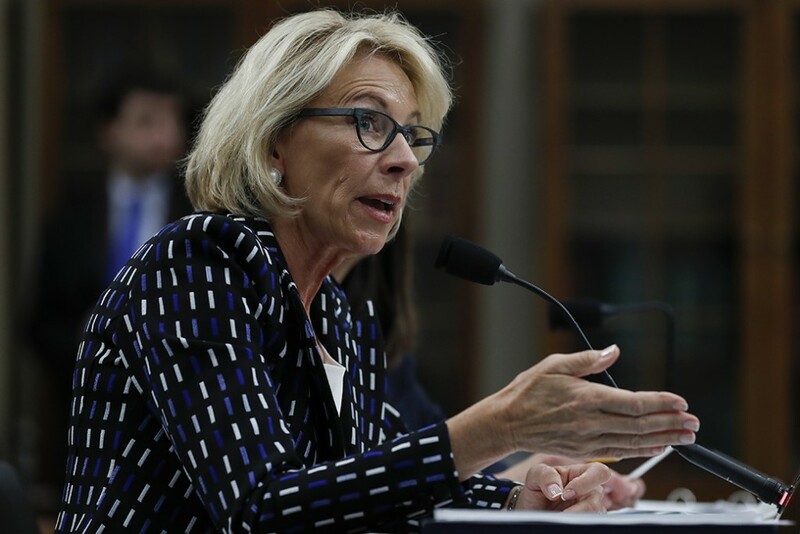 Education Secretary Betsy DeVos claims that the recent shake-up in the student loan servicing model is aimed at “treating students as customers,” but her actions say otherwise. Instead, DeVos and the Trump administration have taken steps to pad the pockets of some of the biggest companies responsible for guiding more than 32 million borrowers through the process of repaying their federal student loans. In a move that will put borrowers’ interests on the back-burner, the U.S. Department of Education recently amended a request for bids on a new federal student loan servicing contract. The changes strip multiple requirements that would ensure that borrowers—especially those with a high risk of default—receive the best servicing when it comes to their loans. Secretary DeVos framed the move as a cost-saving measure, but the contract still leaves in place many high-cost features, suggesting the motivation may be more political than practical. The result: One company will be allowed to call the shots on more than $1 billion in servicing activities with reduced oversight from the Department of Education. Nine companies currently have performance-based contracts with the Office of Federal Student Aid (FSA) to service federal education loans. The idea is that, when servicers are forced to compete based on their performance, they will provide a better experience to borrowers, thus reducing delinquency and default rates. However, multiple servicers can also lead to borrower confusion, as each servicer has its own website, tools, and customer service practices, and it can be difficult for borrowers to figure out which company manages their accounts. The Obama administration tried to fix these challenges last summer when it started a procurement for a Federal Aid Servicing Solution that would take effect in 2019. Instead of disparate systems, borrowers would manage their accounts from a single Department of Education-branded website. A primary contractor would build the site and manage a portion of borrowers’ accounts, while subcontractors would provide customer service to borrowers on a competitive basis, much like the current system. Fortunately, the DeVos amendments maintain the single servicing platform outlined in the Obama administration’s procurement, but they jettison the competitive dynamics used to encourage better servicing. Instead of having multiple companies use a common platform, they announced only one company will manage all aspects of loan repayment for more than 32 million borrowers. Now, the primary contractor is no longer required to propose multiple customer service providers in its bid, a process that would have eventually been taken over by FSA. Although it may be easier for FSA to manage one contractor, what it gains in simplicity it loses in transparency. With one contractor calling the shots, FSA creates a behemoth whose numerous functions, policies, and practices are more difficult to monitor. And without competitive performance metrics guiding the servicer’s practices, FSA relinquishes its ability to push its servicer to innovate and invest more resources in the most vulnerable borrowers. In sum, FSA puts the ease of managing its contractor over the interests of borrowers. The DeVos amendments also ignore the fact that the federal student loan program already tried—and failed—with a single-servicer model. Prior to 2010, all Federal Direct Loans were managed by ACS Education Solutions, whose portfolio encompassed about $292 billion in loans. The other $878 billion was managed by a network of guaranty agencies, who participated as part of the Federal Family Education Loan Program. As the federal loan portfolio grew and ultimately transitioned to 100 percent direct lending, the Department of Education sought more contractors to service the loan volume, and ultimately decided to not renew ACS’s contract. While the Department did not officially cite why the contract was terminated, several senior government officials have stated that ACS mismanaged accounts and was not responsive to directives from the Department. If the new contract amendments go forward unchallenged, the new servicer will be responsible for more than $964 billion in outstanding debt, more than three times the volume that ACS failed to manage appropriately. The riskiest student loan borrowers need additional help to repay their debt and avoid default. But they won’t be getting that assistance under the new guidelines. The amended procurement ends provisions requiring specialized outreach and customer service support for borrowers who are most likely to struggle. Under the original solicitation, servicers were to proactively contact those with a greater risk of default, including borrowers who used a forbearance, recently resolved a default, or did not complete their program of study. It also required the customer service representatives working with at-risk borrowers, including those who are delinquent, trying to enroll in income-driven repayment plans, or seeking to discharge debt through the borrower defense regulations, to receive special training and certification. Stripping these requirements is a big blow to students. Instead of investing the necessary resources into ensuring vulnerable borrowers are on-track, servicers may instead focus their attention on those who need less support to save money. Without a push from the Department of Education, the servicer can make decisions about how borrowers’ accounts should be managed, putting its profits ahead of what’s best for students. The Obama administration’s servicing plan included customer service procedures and online resources to guide borrowers toward successful repayment. However, the DeVos amendments take steps in a very different direction. They scrap features that would allow borrowers to automatically identify how payments should be applied to loans in their account and tools that would allow borrowers to calculate how different payment options would impact their payoff amount. The new procurement also ends a mandate that the servicer include the Payback Playbook, a tool created by the Consumer Financial Protection Bureau that gives borrowers an individualized summary of actionable repayment options, in billing statements. The revised solicitation also removes requirements around basic website functionality and communications. The servicer is no longer required to subject the site to user-testing, and unlike every other consumer-facing FSA website, borrowers will not have the option to navigate the site in Spanish. Income-driven repayment, disability discharge, and delinquency resolution are no longer required in automated phone menus, and the servicer is no longer required to call borrowers who have failed to recertify their income-driven repayment (IDR) plans. This is a significant stumbling block for borrowers, and proactive outreach could do a lot to prevent delinquency and default. More than anything, these changes indicate that borrowers will have to be far more proactive in seeking out information and managing their accounts than they were under the original solicitation, a move that could increase rates of delinquency and default. Although the DeVos amendments removed several borrower-friendly requirements, the contract still contains beneficial Obama-era elements. FSA would still maintain full ownership of the servicing platform and the ability to modify it as desired, so the servicer can’t charge the government to use or take over the portal. All communications from the servicer will be Department of Education-branded and approved by FSA, and customer service agents who call borrowers must identify themselves as being part of the Department of Education so that borrowers understand that the call is legitimate. Students seeking loan discharge under the borrower defense regulations will be able to submit documentation on the web portal, and military borrowers and those with disabilities will still have access to specialized counseling. The servicer is also required to proactively reach out to borrowers whose loans are changing status—for example, if a deferment is ending—or whose income-driven repayment plan is due to expire. In terms of oversight and accountability, the servicer must also make available a complaint tracking system, take part in annual compliance reviews, and provide FSA with procedure and training manuals, the ability to monitor live calls, and access to a real-time call statistics dashboard. It must also follow specific instructions when applying payments and accrued interest to borrowers’ accounts. Even though there’s some good news in the revised servicing solicitation keeping some key elements, a lot of risks remains. With changing leadership at the Office of Federal Student Aid and a history of appointing individuals with conflicts of interest, it is possible another round of amendments could occur, and some of the costlier or more prescriptive elements of the contract could be stripped away. And even if no further changes occur, winding back the clock to an era when just one servicer calls the shots could have a massive negative effect on millions of borrowers’ ability to repay billions of taxpayer-supported loans. If FSA continues hamstringing its ability to oversee contractors in the student loan program, then Congress must step in. Borrowers deserve more from the system, and such large-scale changes should not be subject to the whims of those in power. Colleen Campbell is the associate director for postsecondary education at American Progress. Sara Garcia is a research associate on the postsecondary education team at the Center.